They don't call me the Goddess of Google for nothing. I have been craving chocolate cake! I decided to google my way to the best chocolate cake. Accordingly, the cake I made tonight (YUM!) is the most popular recipe on EPICURIOUS and CHOWHOUND. 1000 reviews. 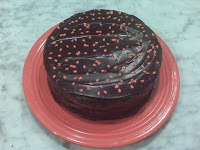 Well, I'm not sure its the best cake in the world (personally, I felt like I missed a buttery undertone, and I might have overbaked it slightly) but its wonderful and not hard to make- but at 1 1/2 pounds of chocolate alone, its hard to carry! Epicurious.com Chef Ed Kasky used Callebaut semisweet chocolate for the cake and Guittard French-vanilla chocolate for the frosting, but any fine-quality semisweet chocolate will produce a wonderful result in either. Make cake layers: Preheat oven to 300° F and grease pans. Line bottoms with rounds of wax paper and grease paper. Finely chop chocolate and in a bowl combine with hot coffee. Let mixture stand, stirring occasionally, until chocolate is melted and mixture is smooth. Into a large bowl sift together sugar, flour, cocoa powder, baking soda, baking powder, and salt. In another large bowl with an electric mixer beat eggs until thickened slightly and lemon colored (about 3 minutes with a standing mixer or 5 minutes with a hand-held mixer). Slowly add oil, buttermilk, vanilla and melted chocolate mixture to eggs, beating until combined well. Add sugar mixture and beat on medium speed until just combined well. Divide batter between pans and bake in middle of oven until a tester inserted in center comes out clean, 1 hour to 1 hour and 10 minutes. Cool layers completely in pans on racks. Run a thin knife around edges of pans and invert layers onto racks. Carefully remove wax paper and cool layers completely. Cake layers may be made 1 day ahead and kept, wrapped well in plastic wrap, at room temperature. Finely chop chocolate. In a 1 1/2- to 2-quart saucepan bring cream, sugar, and corn syrup to a boil over moderately low heat, whisking until sugar is dissolved. Remove pan from heat and add chocolate, whisking until chocolate is melted. Cut butter into pieces and add to frosting, whisking until smooth. Transfer frosting to a bowl and cool, stirring occasionally, until spreadable (depending on chocolate used, it may be necessary to chill frosting to spreadable consistency). Spread frosting between cake layers and over top and sides. Cake keeps, covered and chilled, 3 days. Bring cake to room temperature before serving. Talk about meta- here is a link to an msnbc video about the cake. The recipe is there also. Cape Gooseberries? Ground Cherries? How about a Crumble? Artisinal Kosher Charcuterie with seasonal accompaniments. Travel theme. Theme images by dfli. Powered by Blogger.